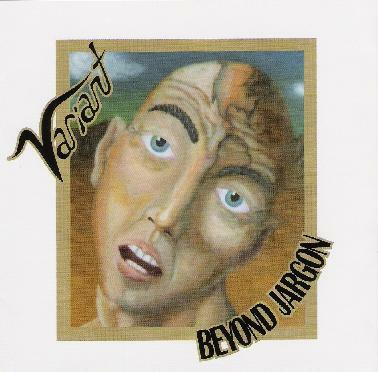 The band Variant hail from Texas, and their debut CD entitled “Beyond Jargon” (57 minutes) is a real mixed bag of music, impossible to pin down exactly. The quartet’s individual duties are quite ordinary, the standard vocals/guitar/bass/drums lineup. Co-founder and lead vocalist (doubling on guitar) Jerry Wengert is the primary songwriter here, and had been working on the tracks for a period of about two years, along with drummer Gary Langton before recruiting the final two members (lead guitarist Erik Connolly and bassist Mike Herrel). The CD production is largely the band’s own, though despite the home-made approach, is professionally recorded and mixed. Furthermore, the band has gotten some online distribution through CD Baby, Amazon, and the like and can even be special ordered by brick & mortar stores through Super D.
The nine tracks are all introduced as individual ‘chapters’ of the whole, and indeed ‘Beyond Jargon’ is categorized by the band as a conceptual work, or as they call it, an “audio novel.” I can’t really suss out the underlying concept without a full narrative…the first half of the album is heavy on big, epic sagas of conquest, whereas the latter half seems to turn rather introspective. The opening song “March to War” sounds for all the world like something from the NWOBHM c. 1980, and in particular, Diamond Head. However, the heavy, driving riffs of this track are never duplicated through the rest of the album, so we get an inaccurate first impression. Wengert’s singing is confident and tuneful, with a rich, resonant voice similar to that of Jeff Martin of the Tea Party. “Today I Tried” then takes off already on a tangent, a jangly, quirky tune with seemingly no sense of direction, and as such comes out reminding me of Carnival of Babylon-era Amon Duul II. Variant’s writing style on many tracks here matches the kind of bizarre, herky-jerky nature of AD2, the result being the occasional awkward “jump-cut” transition. That hardly sounds like a compliment, but when well done, left turns made without warning can really liven up an otherwise ordinary composition, and that’s the way it works here. Chapter 5 turns to 6/8 time in the form of “Carrin’ Carrion,” another odd song which gives you the sense that the next passage may be just about anything. I can’t even really tell you if I like it…it is just kinda puzzling. That’s followed up by “Going” - again not sure exactly where it’s taking you. Seemingly a random collection of disjointed musical passages, thrown together in whatever order came to pass. Chapter 9, “When the Lights On,” takes another final turn, toward a more delicate, melodic jazzy feel here with three separate intertwining guitar lines. I suppose one would have to put Variant into some sort of ‘progressive rock’ category, but apart from that, their sound is hard to pin down really. Not much in the realm of psychedelic/space rock with no synths/keyboards, but they are still “out there” in some sense. They really do sound like some peculiar mix of Diamond Head, Amon Duul II, and the Tea Party. So if you like some meaty guitar, some quirky songwriting, and strong melodic vocals, this might be for you. Frankly, upon first hearing, I wasn’t so sure that I was going to like this album, but I find it growing on me because, oddly enough, it almost seems like they don’t know what they’re doing. Or even what they’re trying to do. The musicianship is good, but not outstanding in any dramatic way, but this kind-of “throw-out-the-rulebook” songwriting style won me over in the end. So I recommend this strange album for its bold approach to song composition. For more information you can visit the Variant web site at: http://www.musicbyvariant.com. Hear Variant at their Myspace page at: http://www.myspace.com/variant.